Last month while checking out the news headlines I came across an article that I shared on the forums that talked about Russia using an Iranian airbase for the first time. Russia was using the Iranian airbase as a launch pad to make their air strikes in the Syrian war. The significance of this article was that this was the first time that Iran had let another country use its airbases for military conflict. At the time, I found the article interesting because it showed me that the cooperation between Moscow and Tehran was increasing dramatically. This is important in the scheme of things related to the coming Gog/Magog prophecy event in Ezekiel 38-39. It wasn’t but a couple of days and then Iran had announced that Russia would not use the airbase anymore. Just as soon as the prophetic light began to shine, it quickly went out. Or at least that is the way it appeared to me. While going through the news headlines this week I came across an article that talks about the growing strategic alliance between Russia and Iran. It also mentions Russia’s improved relations with Turkey. All of this is clearly important and relevant to Bible prophecy watchers. THE AUGUST 16 announcement by the governments of Russia and Iran that Russia had deployed fighter jets at the Iranian airbase in Hamadan (southwest of Tehran) and that sorties were executed against military targets of Islamic State and Jabhat al-Fateh a-Sham (formerly Jabhat al-Nusra) in Syria is a turning point in developments in the region. To date, the Iranians have allowed Russia to use their airspace for attacks in Syria as part of the military cooperation between the two states, which has grown tighter since September 2015. But Iran, in the post- Islamic Revolution era, has never allowed another country to station military troops on its soil, especially not Russia, given Iran’s lingering suspicions of its intentions. While the article talked about the new development being mainly an operational one as it significantly cut down on the travel time Russia’s warplanes had to make on their way to Syria on bombing runs, it also allowed Russian warplanes to carry more bombs, weapons, etc. The article also talked about the losses that Iran and the Assad’s regime had taken recently that could help to explain the use of the Iranian airbase by the Russians. While Iran has since said that use of the air base was “over for now,” it is more important to view the deployment of the planes from Iran as another step in the improvement of relations between Iran and Russia over the last five years, and especially in the last year. The improvement is evidenced by the many meetings between high-ranking personnel on both sides, their cooperation in Syria to save the Assad regime, and – in the foreseeable future – a large arms deal, now under discussion, and close cooperation in the nuclear as well as economic and commercial fields. President Putin will visit Iran this November. As to Turkey’s position in the Russian-Iranian context, given its renewed closeness with Russia, challenging the United States, Turkey may be interested in becoming the third arm of a regional triangle alongside Russia and Iran. Should such a process mature, the results will challenge both the United States and Israel. Looking through the lens of God’s prophetic Word the above quote from the article shows to me that the stage is being slowly setup by the future Gog/Magog allies for the fulfillment of Bible prophecy. While Russia, Iran, and Turkey probably do not have any idea about the prophecies in Ezekiel 38-39, those of us who love ALL of God’s Word know that these prophetic passages speak of a time in last days whereby these three countries lead a confederacy of many countries on an all-out attack on Israel. The purpose of this attack the Bible tells us is for the purpose of taking “a spoil”. Gog, who is the supernatural force behind Magog (Russia), begins to think an evil thought. This thought will lead to the eventual destruction of the confederacy of countries that join the “Big Three” to try to destroy Israel. The Bible tells us very clearly that God will supernaturally intervene in this event and will destroy the vast majority of the invading forces. Even the Russian homeland will not escape God’s anger. We know that from the passages in Ezekiel 38-39 that the rest of the world only offers a “mild protest” against the invading forces upon Israel. From reading this Jerusalem Post article we can see that Russia and Iran is trying to send a message to the “West” regarding the new military cooperation between the two allies. I believe this message is being received by the “West” today and as usual nothing serious is done to counter this development. Obama continues to fiddle while the Middle East burns. Which in turn only emboldens the Gog/Magog allies. While the West continues to sit on its collective hands, the Russians and Iranians are trying to transform the Middle East into their liking. Which will eventually conclude with the shared desire to destroy Israel. Godless Russia doesn’t care about anything, but Russia itself. Iran and Turkey are Islamic and who would love nothing more than to wipe Israel off the map. Russia’s “coming along” by what the Bible calls “hooks in the jaws” will give them the confidence they currently lack to attack Israel. Operationally, flying the Russian planes out of Iran does not in and of itself have much effect on Israel. Either way, Russia is attacking jihadist organizations in Syria – a shared Israeli interest – and it does not much matter to Israel if the planes take off from Russia, Syria, or Iran. Planes leaving Iran to fight in Syria should also not affect the operational coordination agreed upon between Russia and Israel. More important, however, is the overall context of the growing cooperation between Russia and Iran. Iran is already pushing for a large arms deal with Russia, which is liable to change important components in Iran’s military capabilities. Although such arms supplies have been banned by UN Security Council resolutions for the next few years, Iran might try to exploit its hosting of the Russian planes to seal the deal. 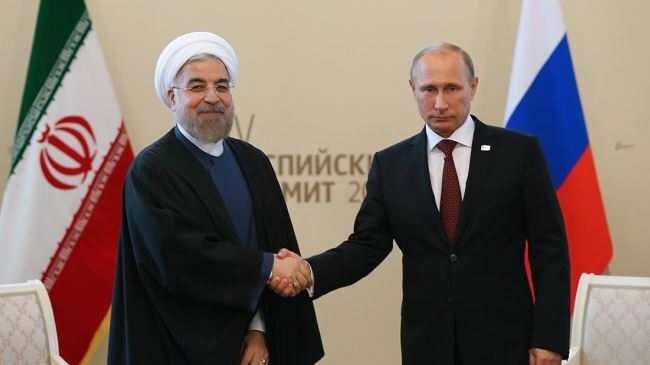 Furthermore, Russia’s participation in the expansion of Iran’s nuclear infrastructure, also under discussion between the two states, runs counter to Israel’s interests. While the article is written from a secular or worldly viewpoint, to really understand what is happening on the ground we must look at the situation again using the prophetic lens of Bible prophecy. I believe we are seeing the initial stages or development of what will eventually be the “Big Three” of Ezekiel 38-39 and that this development will only get worse for Israel as she finds herself all alone in the world. But while the world may eventually abandon Israel, the God of Israel is sitting firmly on the throne in Heaven. He sees all and knows all. While the world may not see what is going on, God does and He is the One that neither sleeps nor slumbers. Russia, Iran, and Turkey will eventually take their places on the prophetic stage and God will use this event to reveal himself to Israel once again. He will supernaturally intervene against Israel’s enemies and destroy them in the mountains of Israel. What would be the certain destruction of Israel, will be a miracle that causes the largely secular Israel to turn back to God after they see His intervention in their affairs again. It is often said that God does not deal with both Israel and the Church at the same time, so if he has turned His attention and focus back on Israel, then the reasoning is that the Church’s time on Earth is surely coming to a close. And with that, we should eagerly anticipate the soon coming of the rapture of the church. Until next time, keep looking up, our redemption is drawing nigh!